Joshua DeMonte, sculpture; Tetsugo Hyakutake, photography; Sharka Hyland, works on paper; Scott Kip, sculpture; Keiko Miyamori, sculpture/ installation; Brenna K. Murphy, works on paper; Abbey Ryan, works on paper; Sarah Stolfa, photography; Heather Ujiie, printed fabric installation. Each of these artists will display artwork in one of three, three-person shows, and will receive a $500 honorarium. The nine finalists were selected by a jury of artists and curators from a pool of nearly 300 applicants. The jury, which included Peter D. Barberie, Susan Fenton, Richard Hricko, Helen M. Shannon, Miriam Seidel, and Paul Hubbard, looked first and foremost at the quality of the artwork when making their decisions. They rarely considered résumés or education backgrounds, and only in very late stages of judging. The criterion for quality of work varies from year to year, with some juries focusing on, for example, technical craft and expertise, while others might be most interested in the level of innovation in the work. Founded in 1977, the Wind Challenge Exhibitions Series was conceived as a way to provide an exhibition venue at a time when opportunities for working artists in Philadelphia were rare. Over the years it has been recognized for the excellence of the artwork presented and has helped develop national reputations for local artists like Virgil Marti, Bill Scott, Judith Schaechter, and Stuart Shils. The Challenge is open to artists at any phase in their careers, and, because résumés rarely factor into the jury process, the exhibitions typically feature a mix of established and emerging artists. The first exhibition of this year's series will open on October 3, 2009, with a reception from 4:00 to 6:00 p.m., and continue through November 14. On display will be work by Sharka Hyland, Joshua DeMonte, and Keiko Miyamori. The second exhibition will open in January and will feature the work of Abbey Ryan, Sarah Stolfa, and Heather Ujiie; the third exhibition will open in May and will feature the work of Tetsugo Hyakutake, Scott Kip, and Brenna K. Murphy. Artist groupings for each show are determined by Fleisher's Exhibitions Manager, Warren Angle, who, once the nine artists for 2009 were selected, looked for common themes or styles within their artwork and artist statements. For the first exhibition, all three artists are showing pieces that explore architecture, space, and the environment, albeit from very different angles and perspectives. 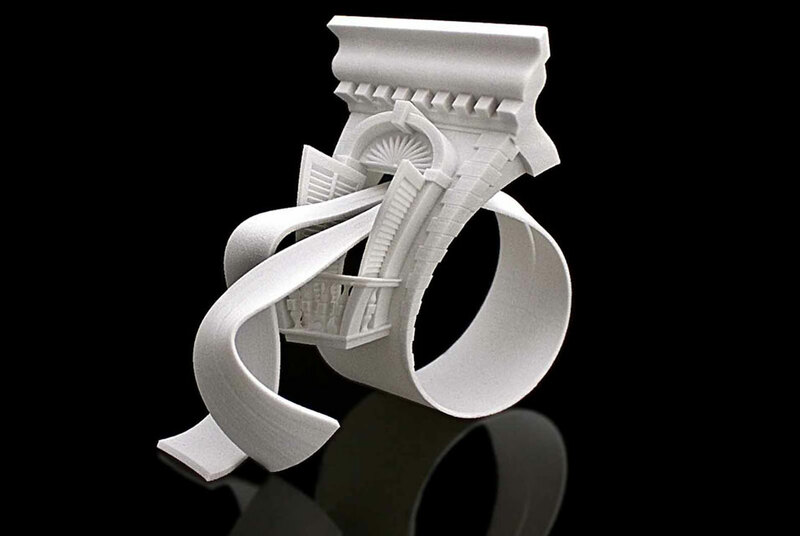 Joshua DeMonte's work explores the relationship between architecture and environment by translating features of ancient architecture into jewelry and transforming the wearer into the site. His objects are intended to be worn and appreciated, but they are also meant to alter one's perception of the figure. DeMonte received both his B.F.A. and M.F.A. from Tyler School of Art, Temple University. Sharka Hyland's paintings and drawings juxtapose her memory of the dense, overlapping European spaces in which she grew up against her experience of America's use of spacetentative, and largely undefined. In her work, Hyland explores how the emotional dimensions of built environments tell vague stories that leave room for speculation. Hyland received her Art History Degree from École du louvre and her M.F.A. from Yale University School of Art. For Keiko Miyamori, the charcoal rubbing not only captures a physical mark, but also transfers the soul of a natural object. Simplicity, quietness, and a sense of unity ebb and flow in Miyamori's objects and installations, which feature rubbings on Japanese washi paper and clear plastic. They are intended to inspire others to live in harmony with nature. Miyamori received both her B.F.A. and M.F.A. from the University of Tsukuba.